Lot 247. A fine and large famille rose 'hundred deer' vase, hu, Late Qing dynasty, Qianlong seal mark; 43.4cm high. Estimate HK$700,000 - 900,000. 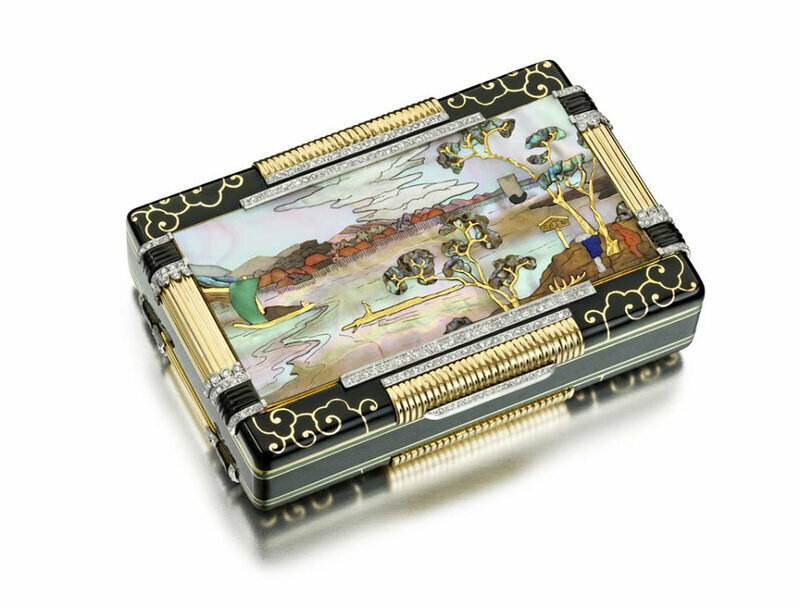 Sold for HK$ 875,000 (€ 92,298). © Bonhams 2001-2013. The bulbous body with gently rising shoulder, flanked at the sides with a pair of gilt chidragon handles, the exterior finely painted to a continuous landscape scene with 'one hundred' deer in white, beige and brown in various activities, including prancing in open fields, grazing, eating lingzhi, drinking from a stream, lying at rest, grooming each other, all set in a lush mountainscape with pine trees, fruiting peaches, and lingzhi, the base with a six-character zhuanshu seal mark in underglaze-blue. 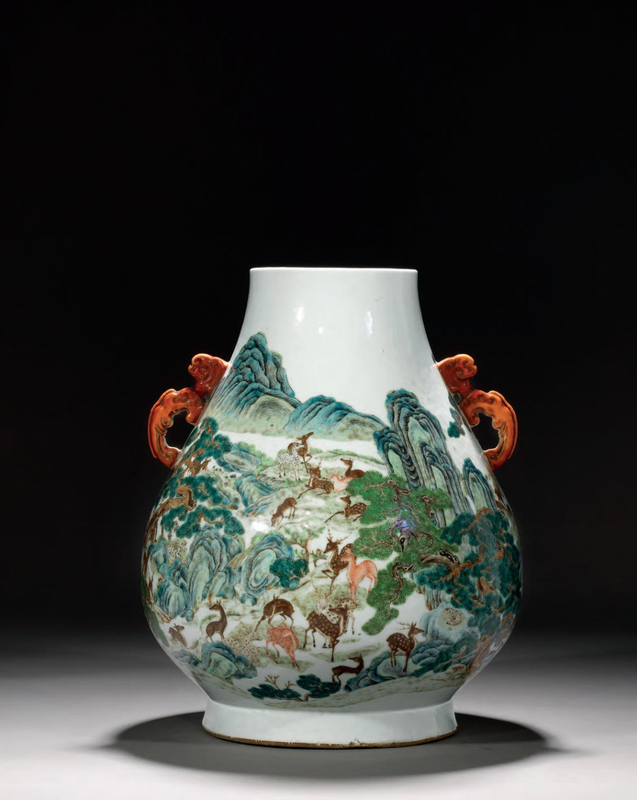 Note: The Qianlong Emperor lived for a long life of eighty-eight years therefore no surprise that the production of 'hundred deer' vases was much favoured during this period. The current lot which is dated to the late Qing dynasty with a Qianlong seal mark is a fine example in celebration of long life where it would have been offered as Imperial birthday gifts. 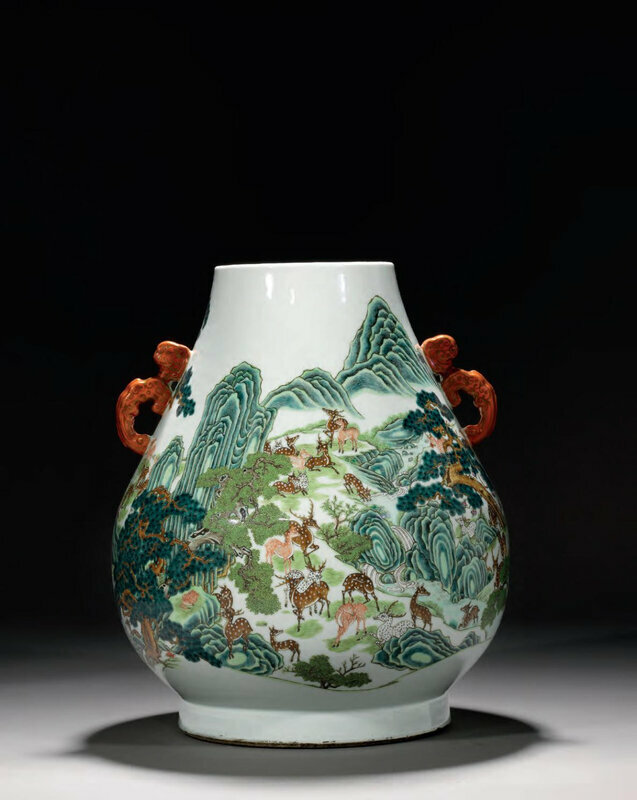 See also another 'hundred deer' vase dated to the Qianlong period with similar amber-coloured handles, currently housed in the Shanghai Museum, Shanghai, illustrated in Qingdai Ciqi Shangjian, Hong Kong, 1994, p.117, no.146, also illustrated in Imperial Porcelain from the Shanghai Museum, Zwolle, 2011, p.87, no.57.